Revenue in the Executive Cars market segment amounts to US$15,584m in 2019. From an international perspective it is shown that most revenue is generated in China (US$32,524m in 2019). The Executive Cars Market segment includes passenger cars of an average footprint around 4.6m2 (50 ft2), an average mass around 1855kg (4100lbs) and a passenger/cargo volume larger than 3.4 m3(120 ft3). Due to their high performance and comfort features, executive cars are often viewed as status symbols. A high share of the Executive Cars market consists of company cars. As automobiles grew in size in the 1950’s, so did their prices rise to accommodate the cost causing a new type of vehicle to emerge. The term “Executive Cars” started to be used in 1960’s to describe large, expensive cars which target consumers who comprised largely of upper-middle class: mid-senior and senior managers, as well as other successful professionals. Due to a growth of large (family cars), fuel efficacy and other factors, many manufactures stopped producing executive cars in the 1990’s and allocated their efforts in other market segments. Example Models: Audi A6, BMW 5 Series, Jaguar XF, Peugeot 607, Saab 9-5, Volvo S80. Reading Support Revenue in the Executive Cars market segment amounts to US$15,584m in 2019. 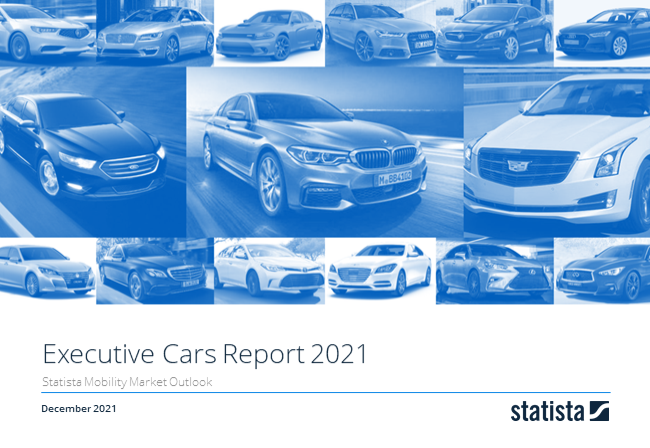 Reading Support In the market for Executive Cars, volume is expected to amount to 406.3 t cars by 2022. Reading Support The average price per unit in the market for Executive Cars amounts to US$35,931 in 2019. Reading Support With a market volume of US$32,524m in 2019, most revenue is generated in China. Here you can find more studies and statistics about "Executive Cars".